From TRD Los Angeles: The brokerage world was traditionally divided into two distinct tribes. Residential brokers were the aesthetes, the innovators, the people who didn’t shy away from using glamour to sell real estate. Commercial brokers, meanwhile, were the jocks and the quants, swearing by spreadsheets to land that plum leasing assignment or investment-sales deal. Never the twain shall meet – or so we thought. Now, however, the two realms are increasingly overlapping. Office buildings are starting to offer valet services and bars; commercial brokers are selling homes; and residential brokerages are launching commercial divisions within their firms. The crossover is impacting marketing — or at least, industry experts are saying it should. “What these (residential) brokers will do for a $2 million listing with drones and staging is phenomenal,” Carl Muhlstein of JLL said at The Real Deal’s Sept. 14 panel event. “So we’ve been applying a lot of those techniques to commercial.” Muhlstein recently returned from a trip to London, where he met with JLL’s European marketing team to discuss ways in which commercial folks can up their game. Behzad Souferian of the Souferian Group launched an entire brand, called “Be,” for hybrid commercial properties that bring in residential and hospitality elements. Its flagship location at 1800 N. Highland in Hollywood looks more like a boutique hotel than office site — equipped with Instagrammable walls and finishes, a concierge-type security post, valet services and a pet-friendly bar. The Be brand is “at the intersection of commercial meets hospitality,” he said. The developer isn’t the only one dipping his feet in both ponds. Jay Luchs is a household name as a retail broker with Newmark Knight Frank, thanks to prolific signage throughout L.A.’s Westside. He’s solidified leases for clients including Louis Vuitton and L.A.’s first Eataly. But, in recent years, he’s also teamed up with a social media-savvy residential partner, Steven Schaefer. Together, they launched the residential Schaefer & Luchs under the NKF umbrella. The partners represented music producer Jerry Goldstein in the $10.4 million sale of his home in the Pacific Palisades in 2015, and have the listing for a $26.9 million home in Malibu, which hit the market earlier this summer. Meanwhile, residential firms are also trying to get a piece of the commercial pie. Residential brokerages Partners Trust and the Agency have both stepped into the commercial market. The newly formed commercial team at Partners Trust grossed $57 million in 2016 sales, according to company statements. The Agency announced the launch of its commercial advisory division, led by Alexander Koustas, this April. Luchs said those entering the commercial market for the first time must step out of their comfort zone. While Instagram posts, flashy open houses and charismatic personalities typically help when an agent is trying to sell a home, they do not suffice in the world of commercial leasing, where brokers must work with tenants on business strategy and specific goals, Luchs said. Luchs primarily relies on his contacts in the industry and some direct email marketing for his commercial properties. 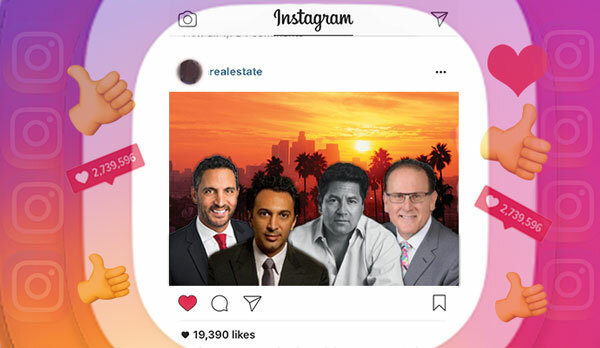 When he’s trying to sell a home, however, he often buys advertisements in magazines and billboards while his partner, Schaefer, posts them on his Instagram page. Partners Trust’s Dario Svidler, who leads the commercial team of six, is taking a more aggressive tact than some commercial veterans like Luchs. He said he is leveraging the resources at his firm — including a full marketing and publicity team — to stand out from his commercial peers. “It’s a little bit of a blend of single-family marketing, combined with the prowess of commercial property,” Svidler calls it. His “script” changes with every listing. He recently had to do a second drone shoot of a $17.5 million property since the first one wasn’t up to par. At the Agency, Koustas calls his strategy a “bit of a hybrid,” which might include open house-style events with broker giveaways and influencer marketing, in addition to emails and brochures. “We make sure that our marketing piece is very simple but gives all the information that anyone would need to dive deeper,” Koustas said. Souferian said he’s taken on a “white gloves approach” by letting his tenants market for him. With themed music nights, splashy walls painted by local artists and customizable marketing materials for each tenant, Souferian said he’s designed his commercial sites in a way that makes it easy for tenants to post on social media.